The Queen Elizabeth-class battleships were a class of five super-dreadnoughts of the Royal Navy commissioned in 1915–16. The lead ship was named after Elizabeth I of England. These battleships were superior in firepower, protection and speed to their Royal Navy predecessors of the Iron Duke class as well as preceding German classes such as the König class, although the corresponding Bayern-class ships were competitive except for being 2 knots (3.7 km/h) slower. 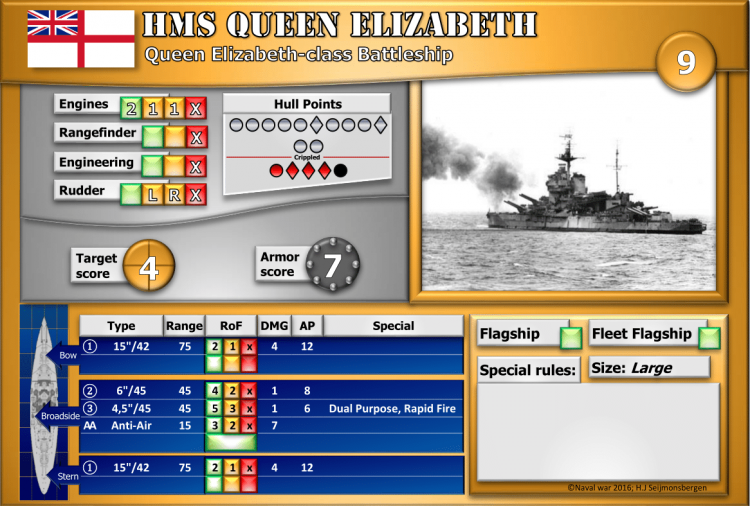 As such, the Queen Elizabeths are generally considered the first fast battleships. The Queen Elizabeths were the first battleships to be armed with 15-inch (381 mm) guns, and were described in the 1919 edition of Jane's Fighting Ships as "the most successful type of capital ship yet designed." They saw much service in both world wars. HMS Barham was lost to U-boat attack in 1941, but the others survived the wars and were scrapped in the late 1940s.